The week's hot weather was enough to drive anyone to cool treats like shave ice and ice cream. The trouble with ice cream is that its fat content calls for the body to continue expending more heat to burn extra calories and fat. 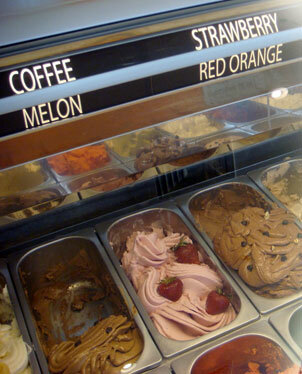 Milano Freezer offers a comparable alternative in the form of gelato, the Italian ice cream with lower fat content than its premium American counterpart. Most of the fruit flavors seem artificial, but heavier ones, like peanut butter and cheesecake, taste closer to the real deal. Best of all is the Donatella, a rich hazelnut chocolate that'll satisfy a double craving for something cool and chocolatey. Refrigerators stock nearly double the flavors available in the cases for those who want to take more home, or just in case your favorite isn't one of the flavors of the day. A small, 6-ounce serving is $3.25, and they'll allow you to combine two flavors. Medium is $4.25, and large is $5.75. Toppings range from fresh fruit to nuts and candies like Gummi bears and Sno-caps. A single topping is 95 cents; two are $1.50; three are $2.25; and each additional topping is 75 cents. Cool off with some frosty Italian ice cream from Milano Freezer. Don't forget the toppings! Hawaii-based conductor Stuart Chafetz will once again take the podium when Hawaii Public Radio broadcasts the annual 4th of July holiday concert by the Chautauqua Symphony Orchestra. The concert will, as always, feature a unique version of Tchaikovsky's 1812 Overture. The 5,000 members of the audience receive paper bags as they enter the venue, and are cued by Chafetz to pop inflated bags when the cannon part comes up in the orchestral score. The program also includes Gershwin's "Rhapsody in Blue," "The Olympic Spirit" by John Williams, the British "Colonel Bogey March" by Kenneth Alford, medleys from "The Sound of Music" and top 1950s hits, plus, of course, John Philip Sousa's "Stars and Stripes Forever." The concert will be broadcast 3 p.m. Friday on KHPR 88.1 Honolulu, KKUA 90.7 Wailuku and KANO 91.1 in Hilo. Paul Shimomoto, winner of last year's Hawaii Music Award in the Contemporary Hawaiian category, will bring his distinctive repertoire of hapa-haole songs to the Atherton Performing Arts Studio. Backed by pianist Jeanette Trevias and the rhythm section of Mark Tanouye and Shawn Carroll, Shimomoto describes his music -- featured on his two albums "Magic Beside the Sea" and "Sentimental Alibi" -- as "easy-listening, contemporary island music featuring sophisticated and orchestrated arrangements reminiscent of an era that featured the likes of Alfred Apaka, Nat King Cole and Dean Martin." The studio is located at Hawaii Public Radio's office at 738 Kaheka St. Tickets for the 7:30 p.m. concert on Saturday are $20 general, $17.50 HPR members and $10 students with ID. Call 955-8821. ... And since we're already talking about the radio station's studio, it's time for the next live taping of KIPO's "Aloha Shorts" program, featuring local literature as read by local actors. The taping starts at 7 p.m. Sunday, and on the evening's bill is Mathias Maas reading "The Hostile Elders" by Peter Van Dyke, Stephanie Kong reading Bill Teter's "Riding the Koi," and Janice Terukina taking on "Da Tree Uprising" (Lee Tonouchi), "The Legacy" (Gail Harada), and "Conversations Between Shiki and Maunawili" and "Sunday Best" (both by Amalia Bueno). The show is hosted by Cedric Yamanaka. Admission is free to this Atherton Performing Arts Studio event. For reservations, call 955-8821. Bishop Museum's "Traditions of the Pacific: The Year of the Hula" film festival will screen the popular documentary "Na Kamalei: The Men of Hula." Originally shown at Sunset on the Beach during the 2006 Hawaii International Film Festival, as well as on PBS nationwide recently on the "Independent Lens" series, the film is a candid, behind-the-scenes look at the hula halau of Robert Cazimero, as they prepare to compete, after a decade's absence, in the 2005 Merrie Monarch Festival. Cazimero talks in the film about his evolution as a hula dancer and a kumu, and his students share their experiences within the halau and their feelings about being kane dancers. Directed by Lisette Kaualena Flanary, "Na Kamalei" is a copresentation of Lehua Films, Independent Television Services and Pacific Islanders in Communications. The screening is at 7 p.m. Tuesday with a $5 admission, free to museum members. Call 848-4187.